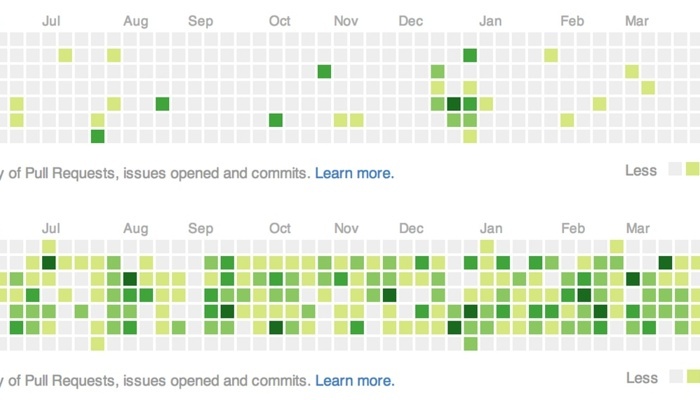 My public (top) and private (bottom) activity on GitHub over the past year. The image above shows the two different views of my activity over the last year, with public activity on top and my private view on the bottom. Apparently it's been a private year: of my 1,189 commits, only 67 show up in public. That says that while it's been a productive year in general, it hasn't been much of a year for the side-projects that tend to be my public contributions. While that's not all bad—I've had plenty of chances to play with interesting technology at Emcien—there is something cool about developing side projects. On the bright side, 25 of those public commits have been to StreamMachine in the past month. I launched the online streaming project with KPCC on May 1 of last year, just before I left the station to head east, and it has continued to reliably deliver audio to thousands of listeners every day since. Some of those commits are ones requested by the station, but a number of them are just about wanting to push forward on a project that inspired some big ideas. Those ideas may have taken some time, but the reason I want to see them happen hasn't changed: no one else has implemented exactly what I'm looking for yet.